Posted on December 7, 2016 at 3:19 pm. 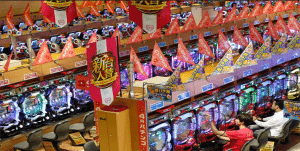 Pachinko parlours are widespread around Japan. Gambling has long been illegal in Japan, but on Tuesday the first steps were taken towards opening what analysts have estimated could be a $30 billion a year casino market. The long-awaited casino bill was passed by Japan’s lower house government and has now been sent to the upper house, where it’s expected to be passed before the current parliamentary session ends on December 14. Some members of parliament were so strongly opposed to the legalisation of gambling in Japan that they exited the chambers in protest of the bill. Likewise, the prevailing public opinion is that legalising casino gambling will see a surge in gambling addiction, crime and corruption throughout the country. Regardless of the lack of public support, Prime Minister Shinzo Abe and the ruling Liberal Democratic Party (LDB) are backing the bill, hoping to boost Japan’s economy and breathe much needed life into the country’s tourism market, especially following the 2020 Tokyo Olympics. If Japan is to legalise casino gambling, it will provide strong competition for Macau, the leading gambling region in Asia, which is currently struggling under China’s anti-corruption crackdown. Supporters of the bill believe that Japanese casinos could bring in billions of dollars in revenue, not just due to tourism but also supported by the wealthy Japanese population and the existing interest in other forms of gambling, like horse racing and pachinko. If the bill is passed, Tokyo, Osaka and Yokohama could provide the locations for the next world-class integrated casino resorts. Those against legalising gambling are concerned that young adults are the ones most at risk, as they have not previously been exposed to gambling and remain vulnerable to the risks associated with the allure of winning large sums of money. In Australia, we’re well aware of the problems gambling addiction can cause, so it’s easy to understand why the Japanese would like to avoid the social and financial problems that legalising casinos can bring. However, the concerns about problem gambling and what we’ve has been referred to as the possible emergence of the “casino homeless” seem a little confusing given the popularity and underlying corruption of pachinko. Pachinko is Japan’s version of a slot game, where metal ball bearings are purchased for real money and then dropped into a machine for the chance to win. The game is wildly popular and can be found all over the country. The loophole is that instead of winning money, pachinko parlours only award tickets, which can then be exchanged at the prize counter for anything from pens and cigarettes to pure gold. To get around the gambling laws, winning tickets can be exchanged off site in exchange for cash, technically making pachinko a form of gambling. There’s a whole world of corruption going on with pachinko, with the police heavily involved and happily turning a blind eye to the practice of exchanging winnings for cash. If the public is so concerned about what legalising casino gambling could do to the Japanese youth, they should also be focusing their attentions towards pachinko, with a growing number of adults now addicted to pachinko and pawnshops widely appearing next door to pachinko parlours. Stay tuned to OnlinePokieGame.com for the latest news regarding the legalisation of gambling in Japan, and all other news related to the pokies and the casino industry.